Our customers are essential to our past, present and future. We collaborate with them to define a new category of ingredients. We aim to satisfy our customers: they should be stimulated, happy, and excited by everything we do. We want them to be our ambassadors, and we can only achieve that by creating excellent products and by being a trustworthy and reliable supplier. Safety and security are the most important factors in a person's performance. We want everybody to come to work healthy and go back home healthy and feel welcome in our team through openness and inclusiveness. Personal safety is a priority: it is more important than structure, rules, pay-scales and hierarchy. The same applies for our product safety principles. Our products and ingredients are eaten by living beings: we must stand for the highest safety and quality standards possible. Where needed, we create new standards of hygiene and safety, in collaboration with the industry partners or through associations like the IPIFF. Working at Protix means being a pioneer. 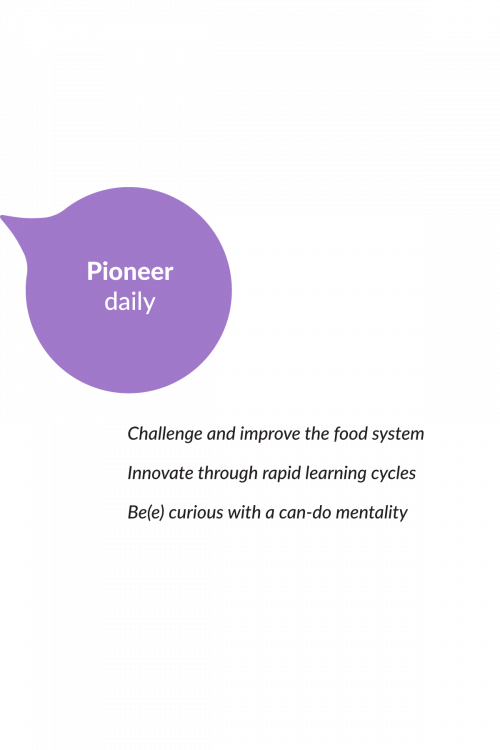 We stand for change in the food system to secure a long-term future for all; that is only possible through rapid cycles of learning and innovation! Protix exists because of all the pioneering that our people do on a daily basis. Through hard, and ground-breaking work, we find solutions for big problems. We keep inventig, making, doing and creating new things. If we keep exploring this way with a can-do mentality, we will pioneer our way into the future. We didn't inherited the earth from our parents; we are borrowing it from our children. At Protix, we care about leaving the best world for our children to live in. We live on this planet with many others: in fact, we are quite a party! People, animals, plants and other living organisms: we all live and breathe on this small blue marble. At Protix, we are not the company that just does the job for customers: we are a group of people that cares about Mother Earth. Actively help each other to become better: that is the way to professional teamwork. If we all make an effort to help one another, we create an unstoppable power. How do you build a company? By showing and taking responsibility for your actions and results; by actively contributing to what needs to be done; and through helping others become better at what they do. It is no coincidence that this is also the way to building a better world. Build with us, so we will be a force to be reckoned with and can have impact on a global scale! The final value needs no explanation: don't forget to eat, drink and relax with each other - celebrate successes, share challenges and stories. Enjoy life! Everybody has a story. Learning about what others go through can be cool, funny, or even life-changing. Find out what someone’s story is and listen carefully – find the small things that are worth celebrating. The best ideas start as conversations, so don’t forget to enjoy your time with colleages, customers, suppliers and even insects if you want to.